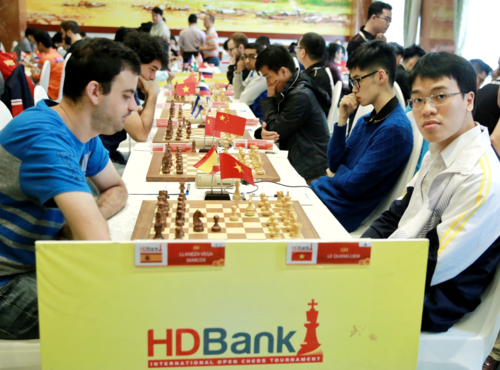 HCM City (VNA) – More than 300 players from 27 countries and territories worldwide will compete at the ninth HDBankCup International Chess Tournament slated for March 7-13 in Ho Chi Minh City. The event offers a chance for the competitors to improve their skills as it will bring together the world’s grand masters, Nguyen Quoc Trung, Vice President of the Vietnam Chess Federation, said on March 4. According to the organising board, among the favourites is the top seeded Wang Hao of China with an Elo rating of 2714. Wang won the event in 2016. Besides, prominent competitors include defending champion Mareco Sandro of Argentina (Elo 2664), number-two seed Cheparinov Ivan of Georgia (Elo 2691), and Russian Demchenko Anton (Elo 2679). Many outstanding female players will also attend the event, including the 2004 and 2006 world champion, Stefanova Antoaneta of Bulgaria; Saduakassova Dinara of Kazakhstan, winner of HDBank 2017; and Gulrukhbegim Tokhirjonova of Uzbekistan, 2017Asian U20 champion. Vietnam will have 150 players joining in the event, including Nguyen Ngoc Truong Son, Tran Tuan Minh, Nguyen Anh Khoi, Pham Le Thao Nguyen, Vo Thi Kim Phung and Hoang Thi Bao Tram. Of note, the tournament will see the participation of Indian prodigy Gukesh Dommaraju, the second youngest grandmaster in chess history. The nine-round Swiss event organised by the Vietnam Chess Federation will have two sections: a masters category for players rated above 2100 and women rated above 2000, and a challengers category for unrated players and those rated below 2100. The event has a total prize purse of 60,000 USD, of which the winner in the masters category will receive 16,000 USD.